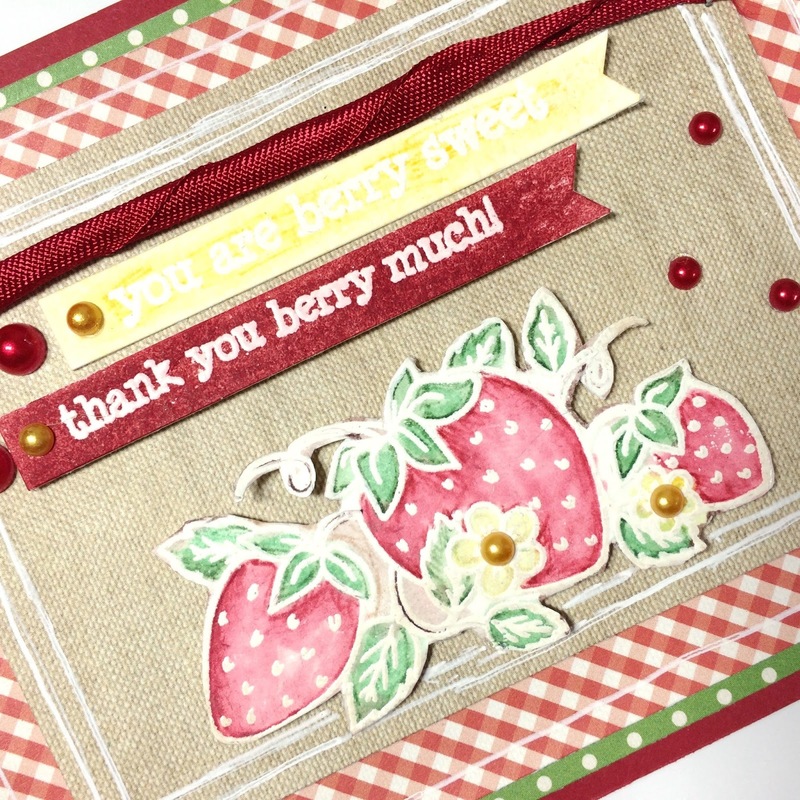 It's the end of August so I have the last of my August Creative Cafe' Kit of the Month projects. 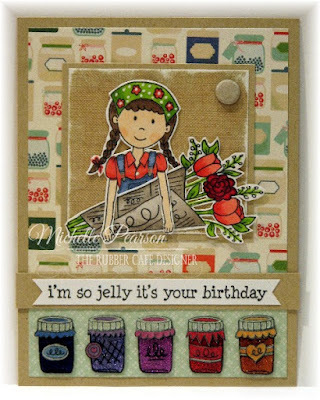 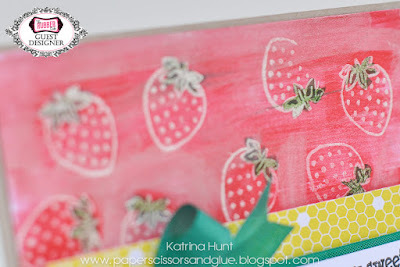 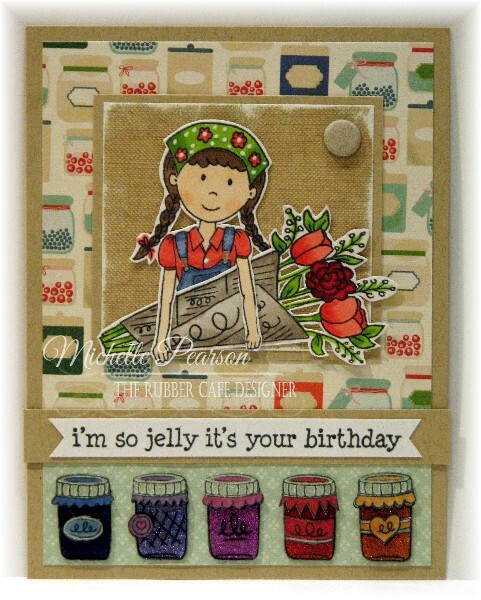 This month's kit from The Rubber Cafe' is called Farm Fresh and it is full of bright, fun, papers, glitter, the "Home Grown" stamp set, and great embellishments. 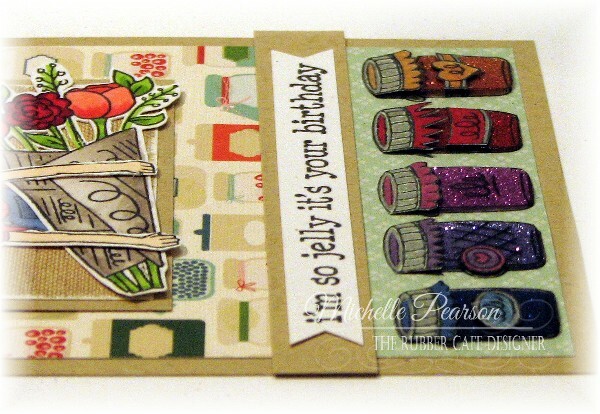 For today's card I used the add on set, Farm Fresh. 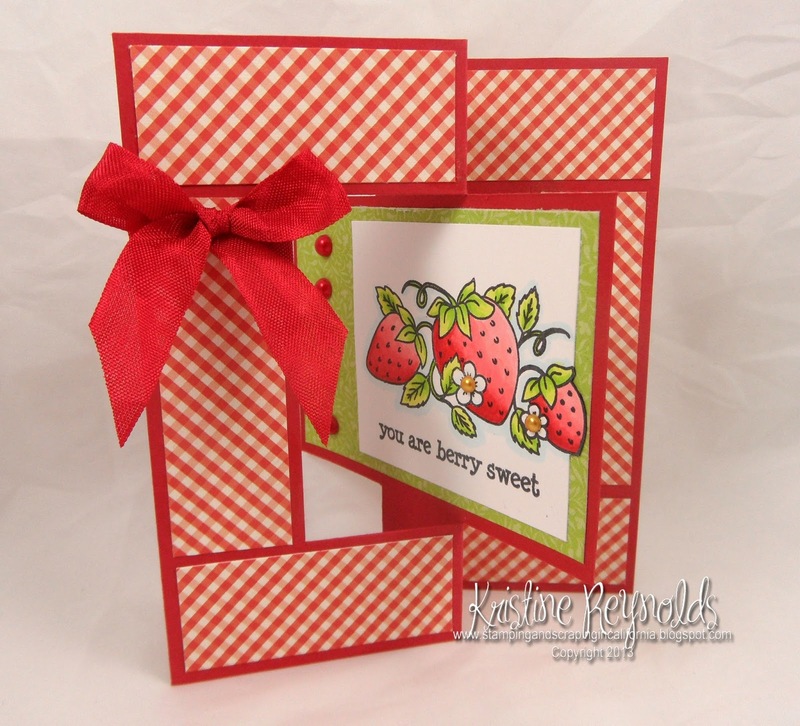 This is the Swing Card that I created. 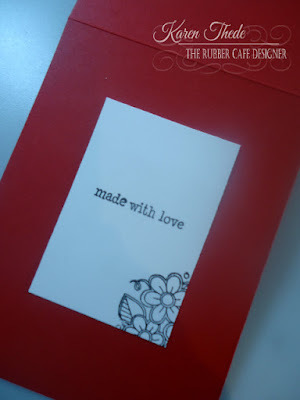 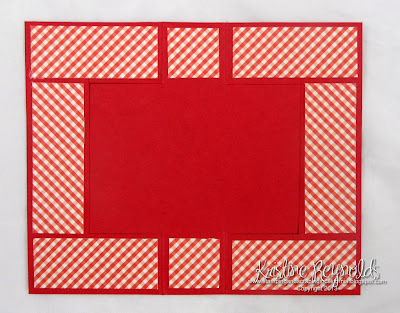 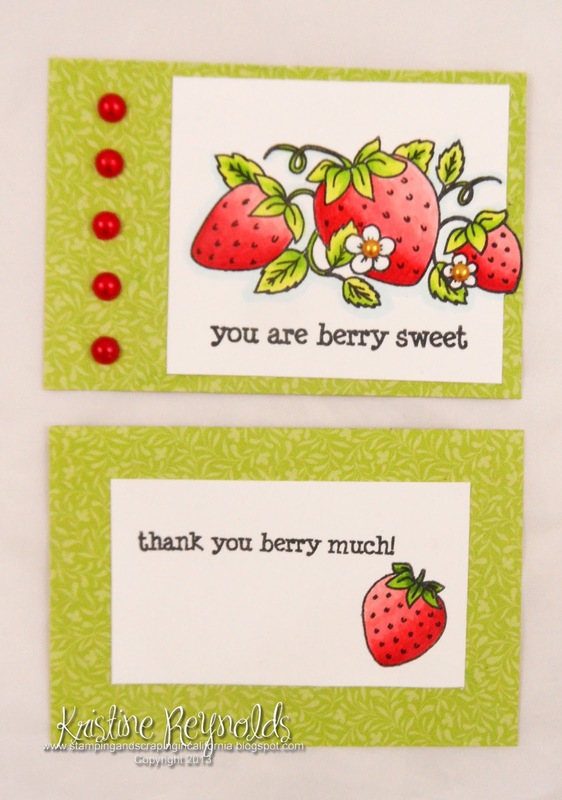 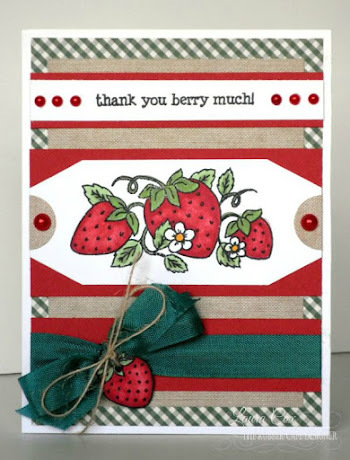 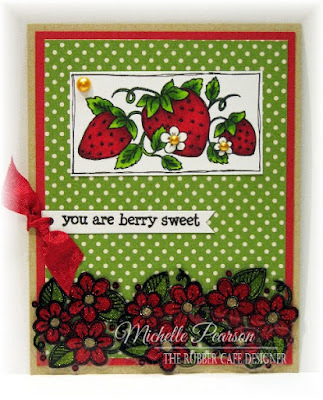 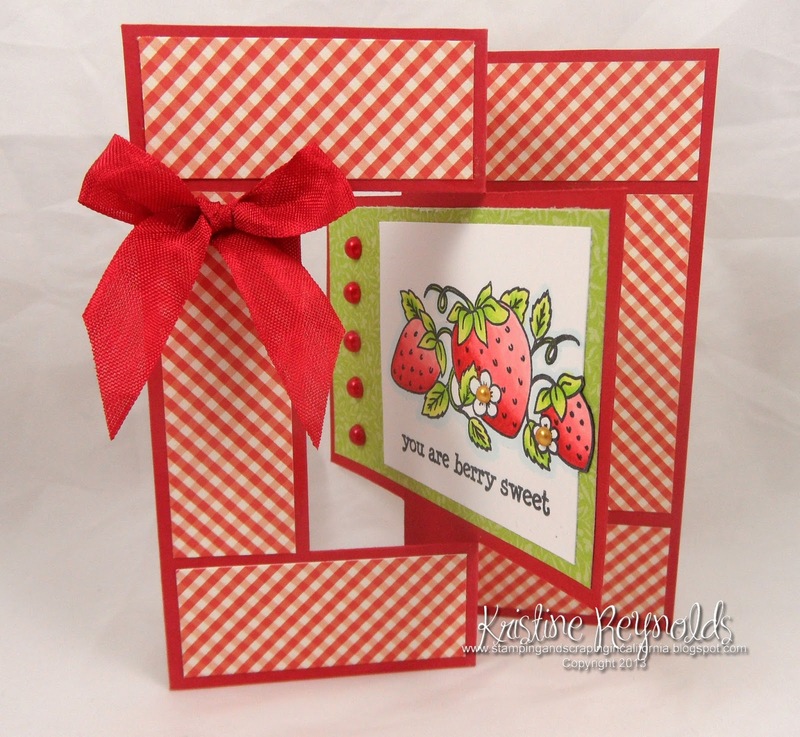 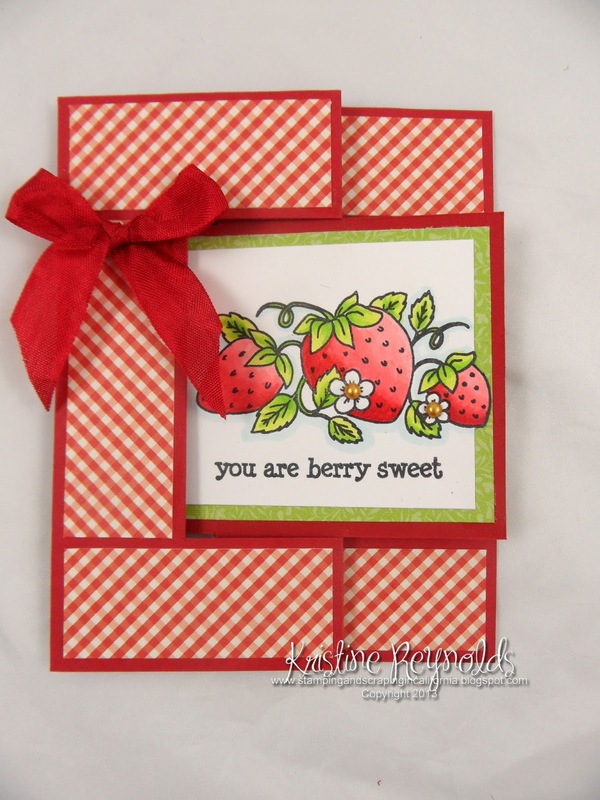 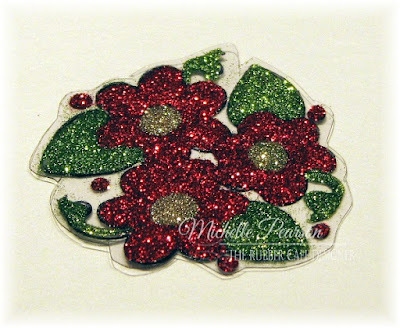 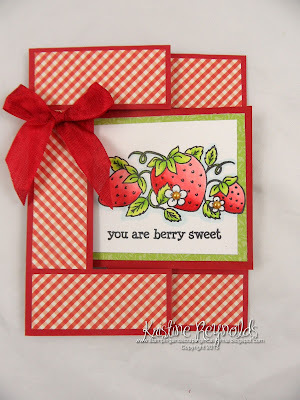 To Create this card start with a 5 1/2" x 6 3/4" panel of red cardstock. 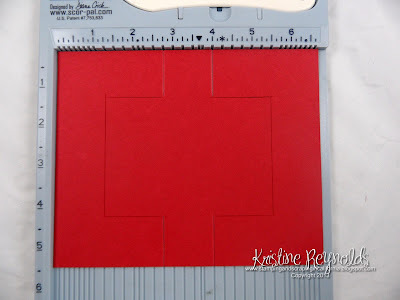 Use a Scor-Buddy to score at 2 3/4" and 4". 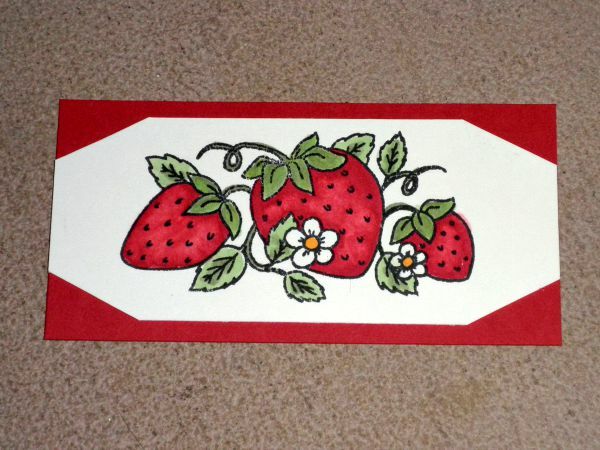 Score on both sides down about 1 1/4". 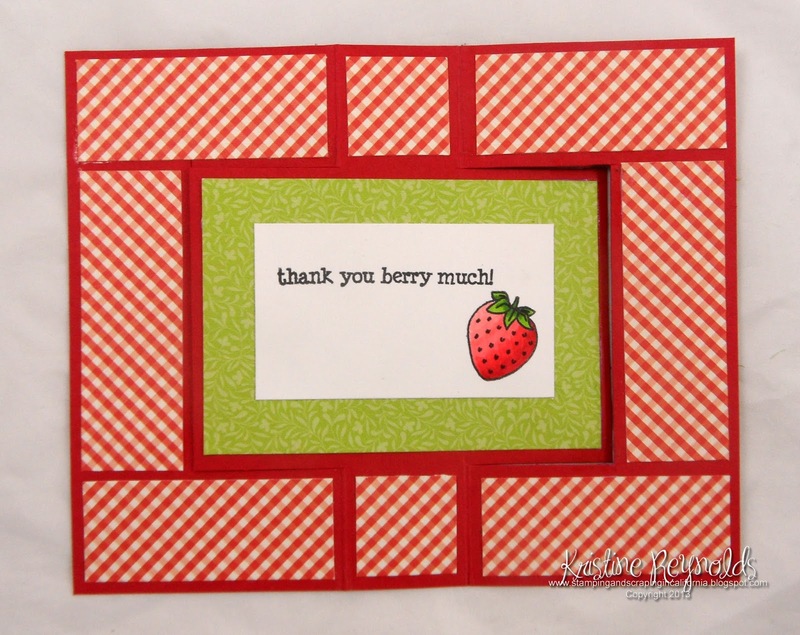 Then I cut the rectangle shape so that there was a 1" border around the edge of the panel. 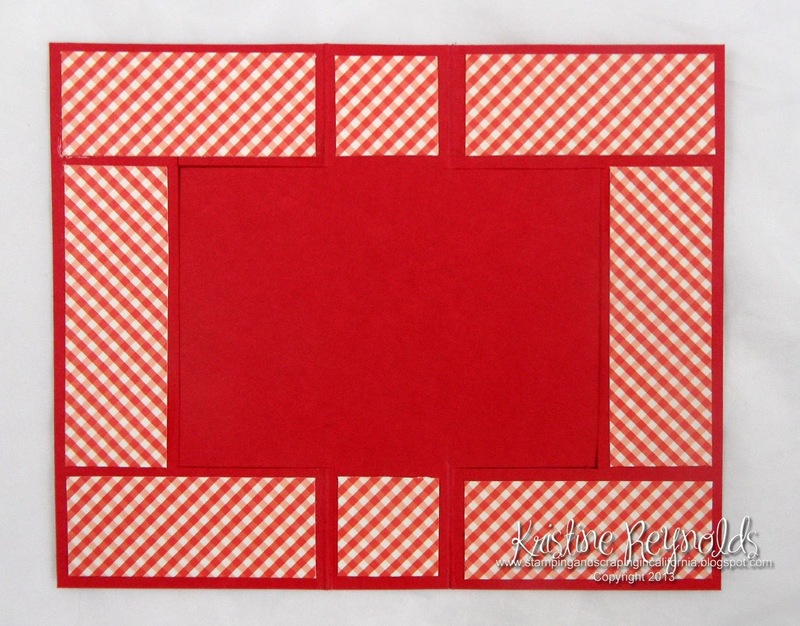 Fold the right edge over on the score lines. 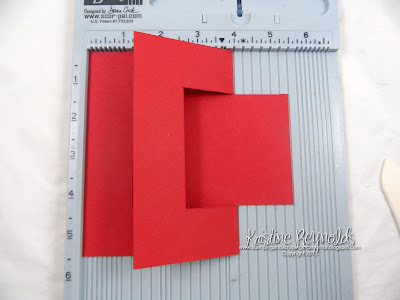 Fold the left side underneath the card on the score line. 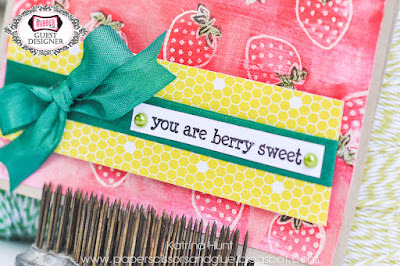 Unfold so the panel lays flat and then add patterned paper from the Echo Park Farm Fresh paper pack using Scrap Happy Glue. Trim two patterned paper panels slightly smaller than the center rectangle. 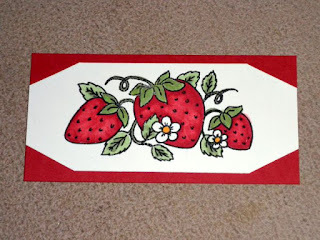 Decorate the two panels with images, sentiments, and red pearls. 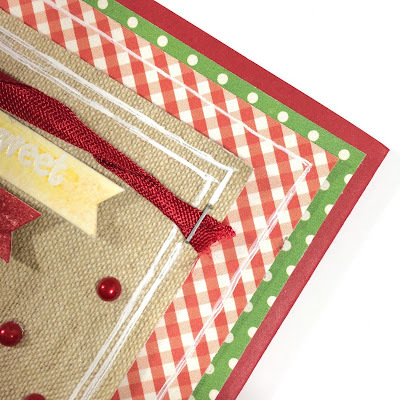 Adhere the back panel to the flattened card panel with Scrap Happy Glue. Adhere the other panel to the other side of the card with Scrap Happy Glue and the fold the card back up. Add a bow and you're all done! 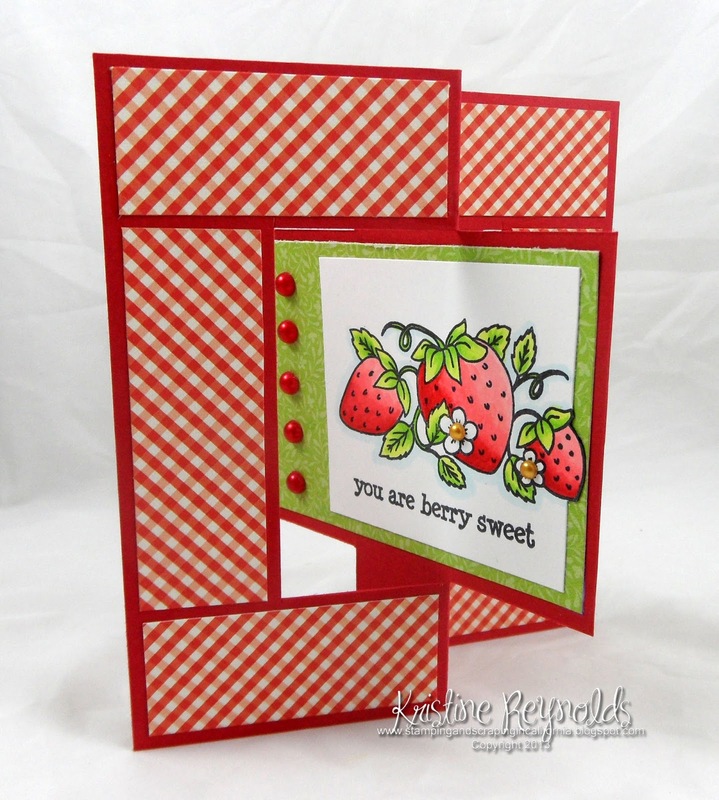 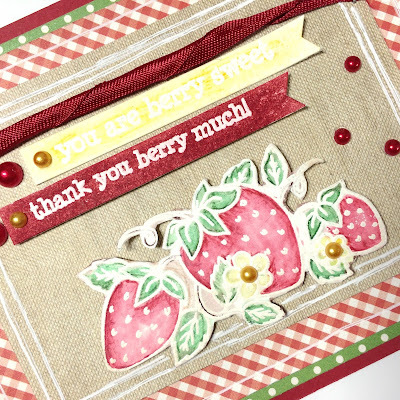 A fabulous fun fold card that will be perfect to thank that special someone! 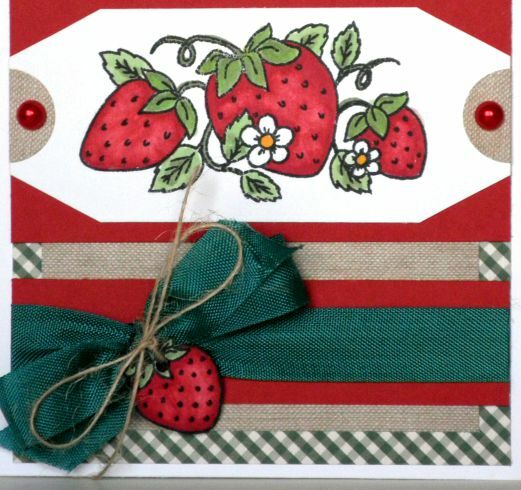 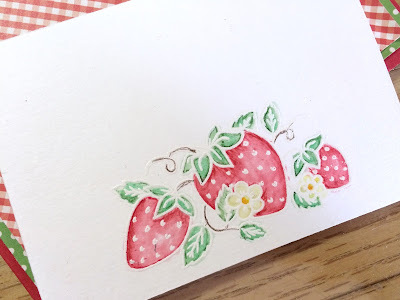 Here's a closer look as those yummy looking strawberries. 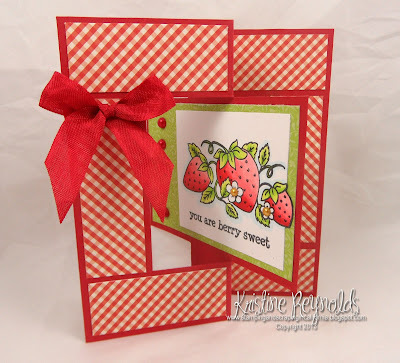 And...a final look at this fun Swing Card. 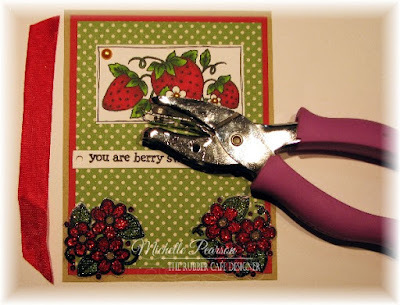 I love using punches and die cutting in my card and paper crafting projects - I'd have to say it's an addiction with me! 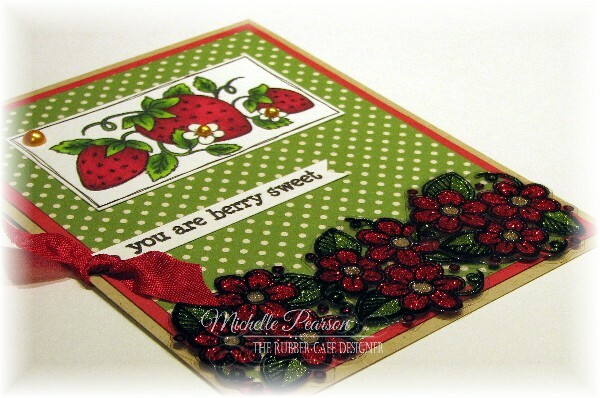 So I'm always looking for different ways that I can do just that to create a simple card. 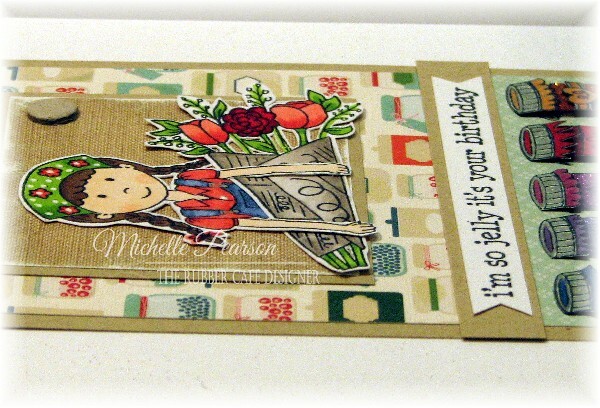 Here's my card today - I saw this idea awhile ago watching uTube, and decided to give it a try with today's card. 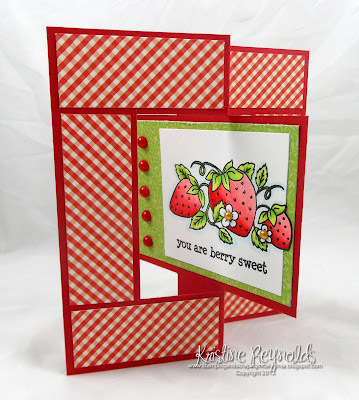 I used a Nestabilities die to create my window or negative space however you could achieve the same with a punch or even a xacto knife. 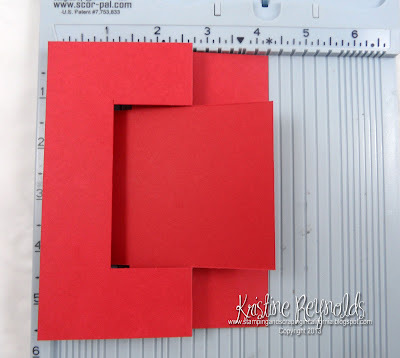 The key is to pop-up the top portion of the piece with the window and layer behind it another piece of white cardstock the same size. 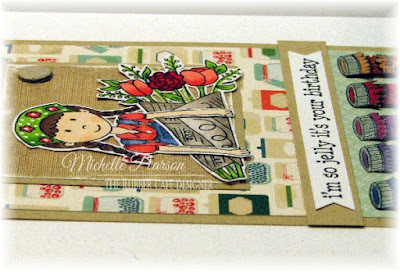 Giving you dimension and an element to work around on your front layer. 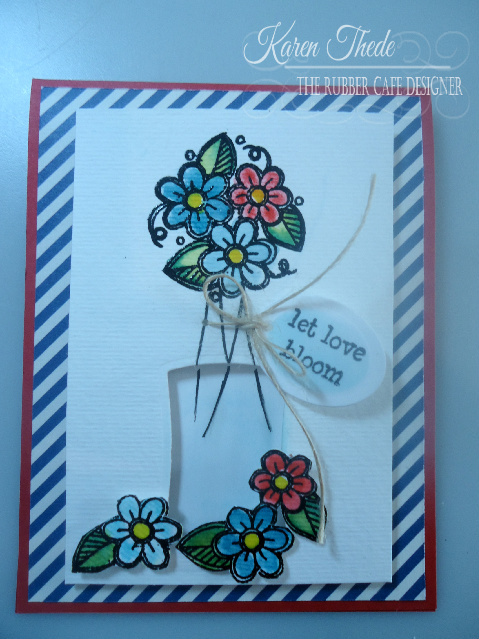 I chose to use the shape I cut into my card as a vase for the bouquet of flowers I added. 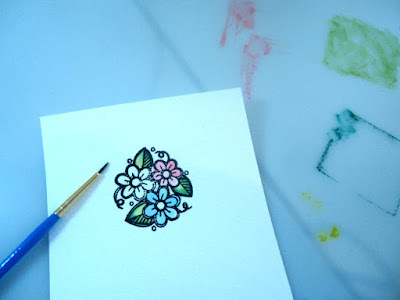 My flowers were stamped and embossed with Rubber Cafe' detail embossing powder, and to color I used my Distress inks, and with a brush, water-colored in my flower. 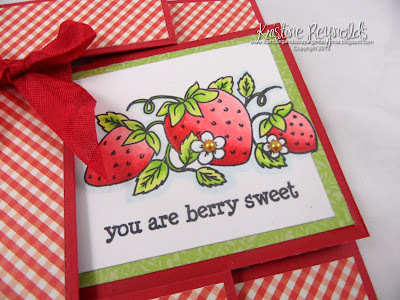 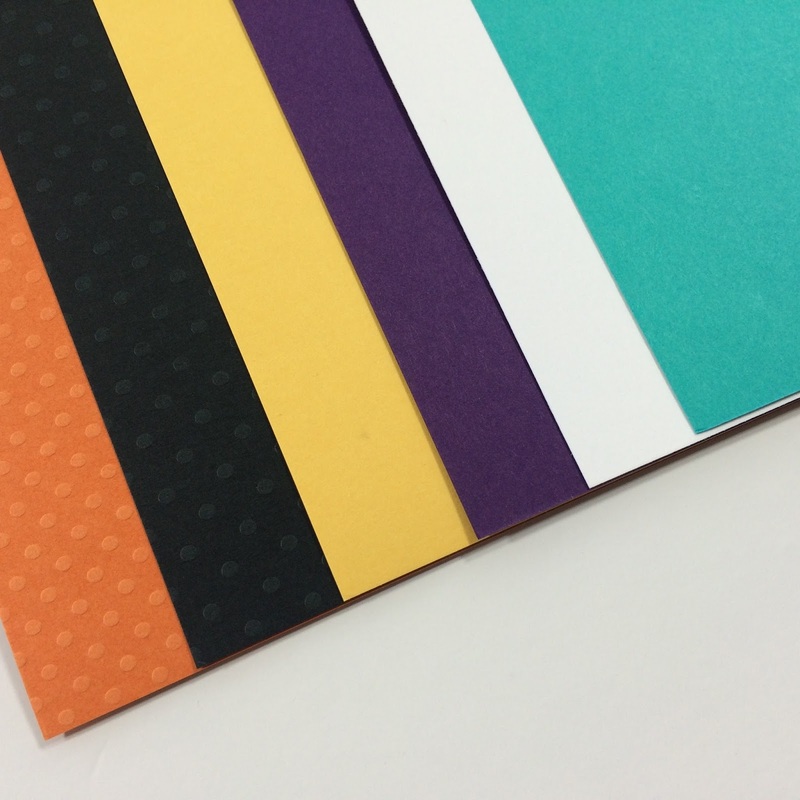 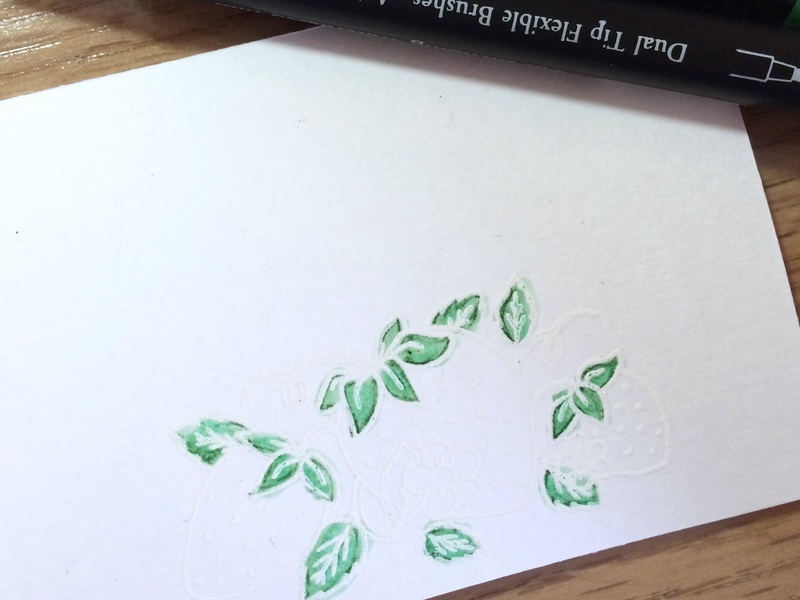 The embossing helped keep the colors contained and from pooling out and into each other. Here's a pic of all the front elements to my card.... in addition to the stamping the bouquet, I stamped and fussy cut additional flowers to apply around the base of the vase- I also free handed in some stems for the flowers which I continued down into the vase on the second layer. 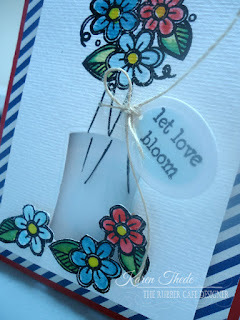 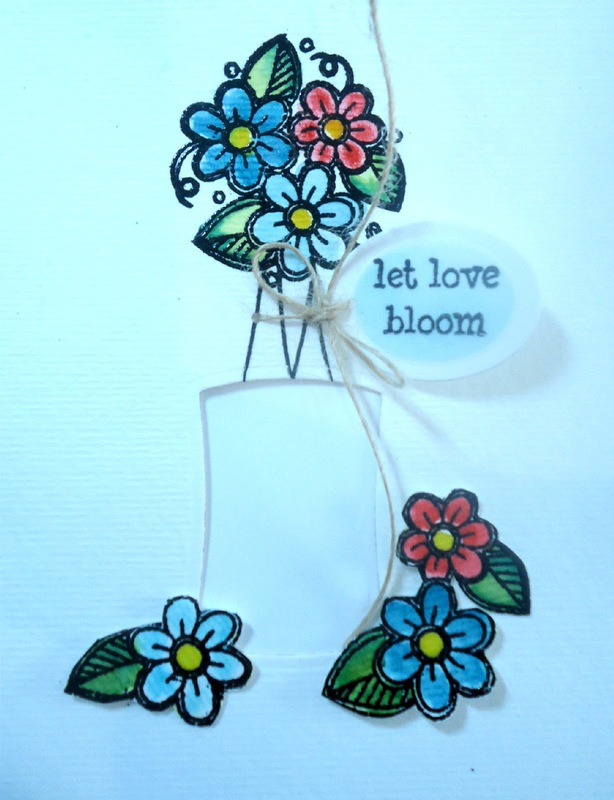 (as you can see in my finished card) To add my tag with the phrase 'let love bloom' I punched tiny holes and wove the natural twine through and tied the ends into a bow. The card was popped up on double layered foam tape - and cut down to 3 1/2 x 4 " - which I applied to a navy diagonal stripe layer cut at 4 x 5 1/4 "- That piece was than put on a Red card cut at 4 1/4 x 11, scoring at 5 1/2" to create a top fold card. 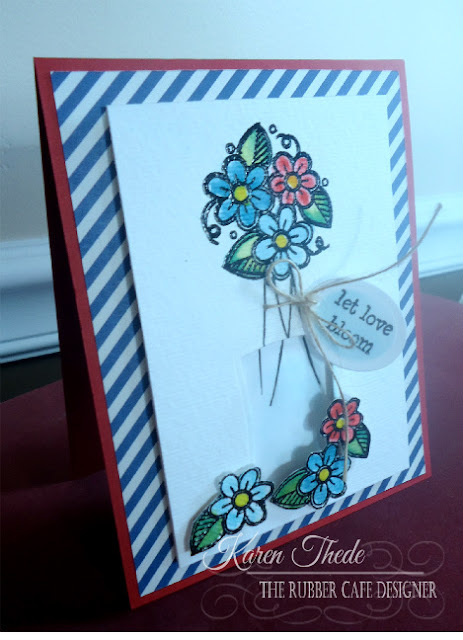 For the inside I cut a piece of white aprox 2 x 3 on which I stamped my sentiment; made with love, and in the lower RH corner stamping off the edge using the floral bouquet stamp. 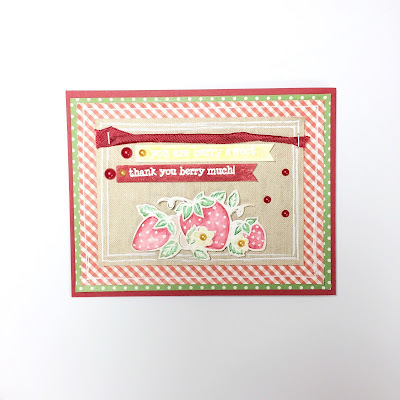 Thanks for stopping by - I hope you'll take a look at your punches and dies in a different way and give the negative space they create a try in your next card or project! 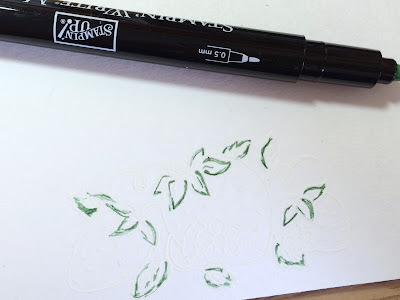 September's Sneak Peek - for the Creative Cafe' Kit of the Month! 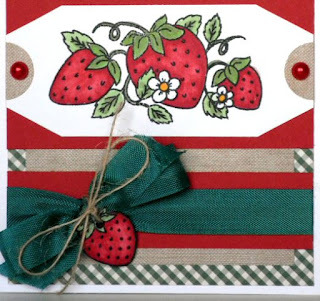 Here we are and summer's end is fast approaching. 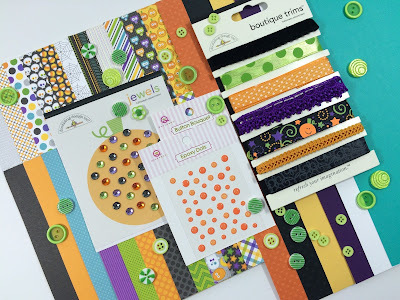 This month we're kicking off fall with some super cute, super fun halloween stamps and coordinating paper featuring a 6x6 pad from Doodlebug! Along with Monster Bash, we've included some of their coordinated halloween boutique trims; enamel dots and gems that will really help get your spook on this month! This month's exclusive stamp sets 'Spooky feet' and 'Monster Lab' are so unique and I know they will both really get your creative juices flowing. So check it out - I just know you're going to love this kit, we're calling Monster Bash! 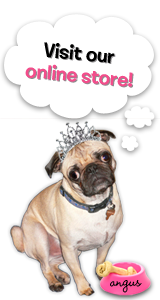 Don't wait or hesitate click now to receive your kit! and finally a sneak peek at the stampset - Spooky Feet!